First 30 minutes that park is open or use Fastpass. 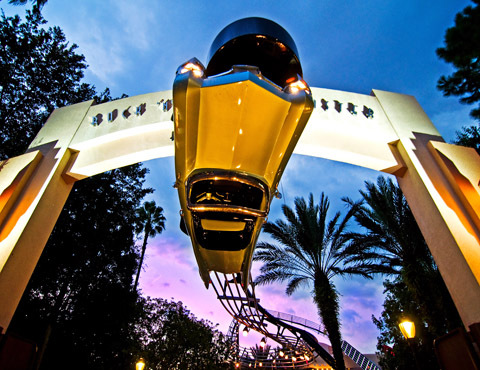 Exponentially wilder than Space Mountain or Big Thunder Mountain in the Magic Kingdom, Rock ’n’ Roller Coaster is an attraction for fans of high-speed thrill rides. 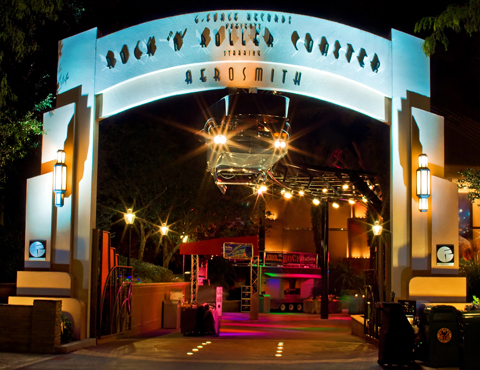 Although the presence of Aerosmith and the synchronized music add to the experience, the ride itself is the focus. Rock ’n’ Roller Coaster’s loops, corkscrews, and drops make Space Mountain seem like It’s a Small World. 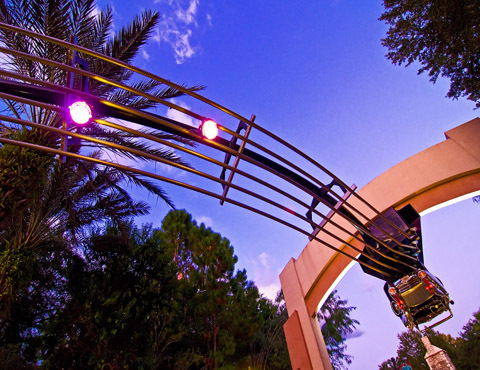 What really makes this metal coaster unusual, however, is that first, it’s in the dark (like Space Mountain, only with Southern California nighttime scenes instead of space), and second, you’re launched up the first hill like a jet off a carrier deck. By the time you crest the hill, you’ll have gone from 0 to 57 mph in less than 3 seconds. When you enter the first loop, you’ll be pulling 5 g’s—2 more than astronauts used to experience at liftoff on a space shuttle. Rock ’n’ Roller Coaster is not for everyone—if Space Mountain or Big Thunder pushes your limits, stay away. Expect long lines except in the first 30 minutes after opening and during the late-evening performance of Fantasmic! 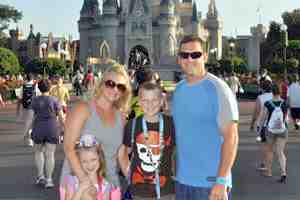 Ride in the morning, or use the single-rider line or FastPass+. Rock 'n' Roller Coaster is a popular FastPass+ selection, but not nearly as many guests head there as rush toward Toy Story Land. If you could not grab a FastPass+ and don't want to do single rider, visiting Rock 'n' Roller and Tower of Terror first before heading to Toy Story Land will be your best plan. This chart shows you roughly how long you'll wait for Rock 'n' Roller Coaster Starring Aerosmith when you visit on a day with a given Disney's Hollywood Studios Crowd Level. The blue bars represent the average "peak" wait time (that is, how long the line will be at its busiest). The bottom and top black lines represent the range of peak wait times to expect (for you fellow nerds out there: it's the 5th percentile and 95th percentile of peak wait times). Please note that these are estimates, and for a better forecast for your travel dates, see Rock 'n' Roller Coaster Starring Aerosmith Wait Times. 48" minimum height requirement; children younger than age 7 must ride with an adult. Switching-off option provided (see page 417). 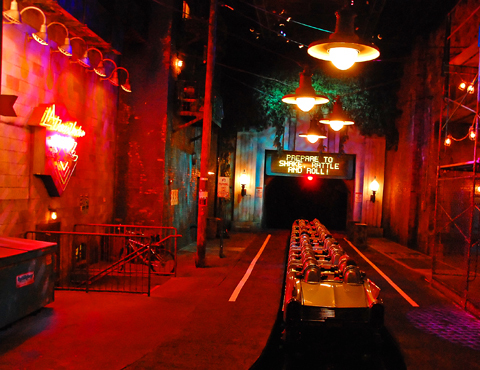 Note that this attraction has a single-rider line.